Who Wants to Be Spidey? Everyone wants to be Spider-Man. You get to swing through the air, climb skyscrapers, and defeat bad guys. You also get to wear an awesome super-suit while you clean up crime! Of course, the best part about being Spider-Man is web-slinging. Now, we've tried to figure out Peter Parker’s secret formula for webbing, but unfortunately, we’re not genius scientists like Peter is. We thought our own dreams of web-slinging were over, until we found this hand little product, that is. This Spider-Man Super Web Slinger Blaster is a quick and easy way to shoot webs like a superhero. 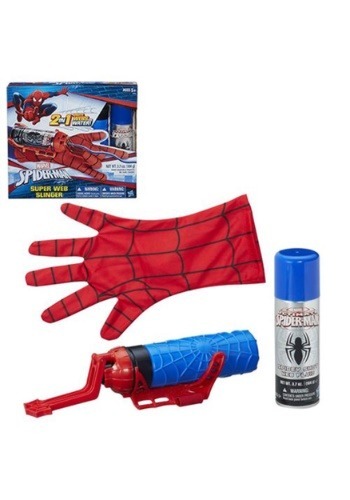 The toy blaster comes with a canister of webbing, a refillable water canister, the wrist blaster, and a Spidey glove. Just put the glove on, wrap the blaster around the wrist and load it with one of the canisters. The web canister shoots aerosol string, while the water canister can be filled with water to shoot water. Now, this Spider-Man web shooter might not let you swing from the rooftops, but it will let you or your child web up a few bad guys! Extra refill canisters once the original one has been depleted (sold separately).